This wonderful harbour-side cottage in an ideal location, with uninterrupted views, sits right at the heart of the famous Cornish village of Mousehole. With its pretty harbour, spectacular coastline, quaint streets, fascinating shops & boutiques and excellent pubs & restaurants, Mousehole has become a popular destination for many people all year round. The spectacle of the superb Christmas harbour lights is world famous, and throughout December the village becomes quite magical. Cornerstone Cottage is a superbly presented, yet characterful Cornish fisherman’s cottage sleeping up to six people in a double bedroom and 2 twin rooms. The living room and two front bedrooms have excellent views over the harbour and out to sea. There is also a fully equipped kitchen, separate utility room and dining room where up to six people can enjoy a meal in comfort. The living room is spacious yet full of character with a fully beamed ceiling and a range of comfortable furniture. 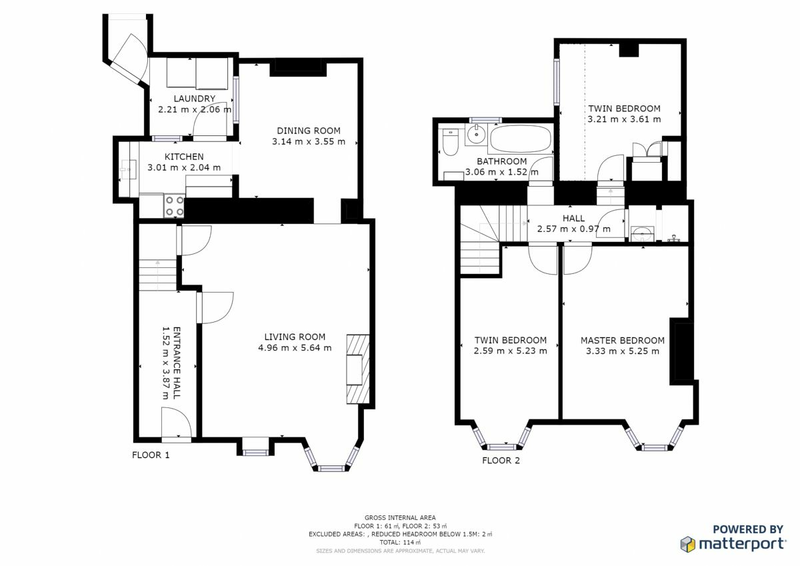 Ground Floor: Living room, dining room, kitchen, utility room & WC. First Floor: Master double bedroom with 6' bed, 2 twin bedrooms with 3' beds, one family bathroom with WC and a shower room with no WC. Heating is via night storage heaters and the wood burning stove. The kitchen is equipped with an electric oven & induction hob, kettle, toaster, and fridge / freezer. In the utility area there is a microwave, dishwasher, washing machine & tumble dryer. The living room has a flat screen Freeview TV & DVD player. WiFi access to free high-speed broadband is available at the property. There is an iron & ironing board available. Electricity, heating, bed linen, towels and beach towels are all included. There is a travel cot with cot linen & high chair available. You will need to provide your own logs for the wood burning stove. There is no designated parking for Cornerstone Cottage but there are two nearby quay car parks, where there is a daily charge of £3. Regrettably, no smoking or pets are allowed. Mousehole is a picturesque fishing village on the south coast of Cornwall between Penzance and Land's End, that has retained much of its old-world charm. The narrow streets are filled with galleries, small shops and restaurants. Local cottages, built from Lamorna granite, cluster together around the inner edge of the harbour; these are protected from the force of the sea by two robust breakwaters. Parking in the village is extremely limited due to the narrow roads and visitors are encouraged to park on the outskirts of the village, or in the quay car parks. The Mousehole Christmas lights are famous throughout Cornwall and are well worth visiting. They are tuned off for one hour on the 19th December on the anniversary of the Penlee Lifeboat tragedy. Mousehole is famed for the lantern parade on Tom Bawcock's Eve held on 23rd December. The children’s book, The Mousehole Cat by Antonia Barber, and the television production of the same name, were inspired by the tale of Tom Bawcock and Mousehole’s own traditional dish of Stargazy Pie. Just offshore from the harbour is St Clement's Isle, a small group of rocks where an ancient hermit was said to have lived. Boat tours of the coast from the harbour are available. A few hundred yards along from the village is a huge cave, which is believed to give rise to the village's unusual name. This is unlikely but the origin of the name is still a mystery. It is possible to walk west along the Coastal Path to Lamorna Cove, or past Lamorna to the Tater Du lighthouse. Inland is the lovely village of Paul and beyond it lie several stone circles and megalithic sites. To the east is Newlyn, the largest fishing port in the South West.